Dennis D. Gaskin, DDS, P.C. Virginia Beach, Virginia Affordable Dentures & Crowns offers several styles of full dentures, each with special features and advantages. It’s part of our mission to put transformation within reach. See below for more details, or call us at 757-655-7292 if you have a question about a particular style. Improve your smile and even your life with dentures and implants in Virginia Beach. 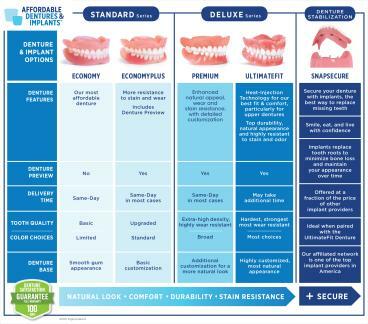 People of all ages rely on Affordable Dentures & Crowns® for assistance. Whether you’ve had an injury or you’re experiencing tooth loss of any kind, we can help you overcome these challenges. We offer several styles of dentures that will fit smoothly, feel natural, and look great. We do things right, and we want to give you a good reason to smile. We have our own on-site lab where our skilled technicians manufacture complete and partial dentures. We routinely work with new wearers, and we have special packages available to make your first set more affordable. Our dentist can also take care of any required tooth extractions in order to expedite the entire process. If you already have a denture set that needs some attention, then you can visit us for relines and all types of adjustments. Missing teeth can impact your smile, which could make you feel self-conscious. That's why we offer dentures and implants that will help give you more confidence. We’re part of America’s largest denture provider, and we’re known for our attention to detail. Give Affordable Dentures & Crowns in Virginia Beach a call today to schedule an appointment. Dennis D. Gaskin, DDS, FICOI, FAAIP is a licensed dentist and the owner of this practice. He�s a graduate of the University of North Carolina School of Dentistry. He offers compassionate service with dignity and respect, and he�s able to explain the different options for handling the problems associated with missing teeth. Please fill out the form below to request an appointment. For immediate assistance, please call us at 757-655-7292.